9/23: Congratulations to our randomly selected winner, Cheryl Pullen Navalinsky! In light of all the loving support we’ve received in the Martha Stewart Living American Made competition, and the deadline for the first round of voting being extended another week (and two days, to be precise,) we’ve decided to hold our very own giveaway! Each time you vote for a nominee in the competition, you enter to win prizes from MSL, like an American Express gift card. Now, every day you vote, you can enter to win prizes from us, too! 1 $25 Etsy Gift Card; 1 Luchador Mask Pillow by Studio Longoria; 1 Bamboo Calendula Bar Soap by Clover Hollow Soaps & Sundries; 1 Blue Rhinestone Bracelet by Leslie Anne Levine; 15% OFF Your Next Purchase at Buy Me Love or JuJu Eyeball on Etsy; 1 Surprise Gift From Our Store, Buy Me Love! Then, comment that you voted below, and include the total number of votes after you voted UPDATE: No need to keep track of the total number of times you’ve voted, personally! Just include the total number on the screen after you’ve voted for the day. For example, if the number is 2,222 before you vote, and you vote for us 6 times, the total you’ll include in your comment will be 2,228. Easy peasy. Sorry for the confusion! Please leave only one “I voted!” comment per voter per day, not one comment per vote. For example, if you use all 6 of your votes on our profile (wink, wink,) there’s no need to comment 6 times – just comment once. 2. For extra chances to win, you can Pin this giveaway on Pinterest , and leave a comment below up to once a day that you pinned, including the pin URL. (After you pin, click the “see it now” button to copy and paste the pin’s URL into your comment below.) This entry method is completely optional. IMPORTANT NOTES: If you leave more than one “I voted!” comment, or “I pinned it!” comment per day, only one of each of those comments will count toward your chances of winning. You do not need to have a WordPress.com account to enter. 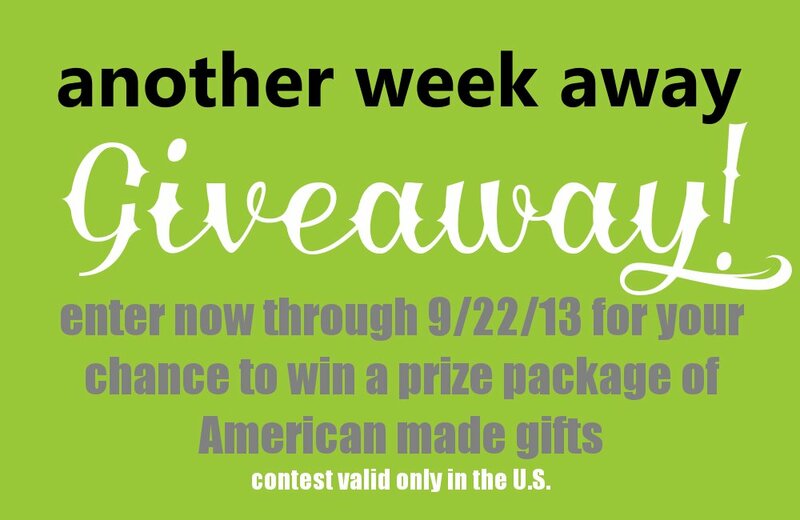 This contest is in no way affiliated with Martha Stewart Living/MSL American Made, or Etsy. Contest valid only in the Continental U.S. The randomly selected winner of the prize package will be announced in this post on 9/23/13, and we will also contact the winner via the email address listed on their account. If you do not have a valid email address listed on the account you use to log in/comment, you must leave your email address in your comment(s.) (The $25 Etsy gift card will also be emailed to the winner.) If the winner does not respond within 48 hours, we will choose another winner for the prize package. Thank you for supporting our small, handmade, and American made business, and good luck to all our voters!